In February, Tennessee Tech University (TTU) College of Engineering announced its Golden Eagle Additively Innovative Lecture Series, an online webinar event that reaches people around the world. The third lecture focuses on a relatively new 3D printing technician certificate offered at Somerset Community College (SCC). The formal title of the third lecture in the series is “AM Research and Applications for Real World Production and Impact” with Eric N. Wooldridge, PE, RA, Professor of Additive Manufacturing, Workforce Development, and Pre-Engineering at SCC, Kentucky. All across the USA, industry is increasingly interested in training for 3D printing. Not many schools offer a degree in 3D printing (yet), two or four year, and fewer have specialized certificates for those interested in the field. From automotive to aerospace, biomedical to home improvement to Hollywood special effects, additive manufacturing training is forecasted for growth. The move to go “certificate” is because industry is asking for students with skills as fast as possible whether referring to additive or welding, it wants technicians that can produce and can produce now. 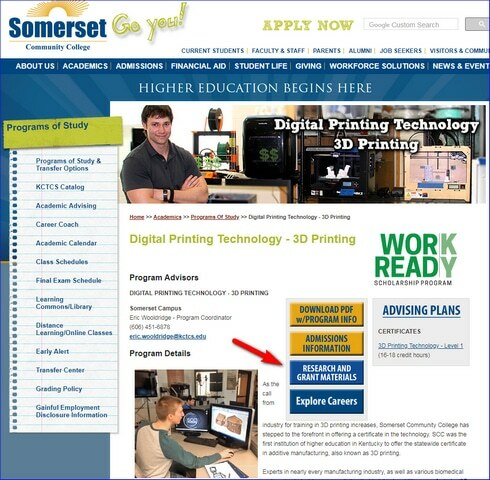 Additive manufacturing is still hardly known and relatively misunderstood, so we created the one-year certificate to allow various Somerset degree programs to add these skills into their Associates degree path and help to integrate additive within the company along with their primary job. We wanted to create an additive “foothold” situation within our state so that existing manufacturers will have someone on the inside that can help them transition faster to the technology instead of lagging behind the curve of their competitors. We also created a demonstration process to entice industry leaders to consider additive within their own operations. We call it the “Netflix deal” where a company can come to us to try an idea with 3D printing – we’ll will take out all the risk of equipment cost, and the need for expertise, etc., produce a demonstration example for them relative to their operations (sort of like a Netflix trial that hooks you into the service). After the experience, most will immediately want to do this on their own – so they send us employees for training – in some cases just one employee, in others we have trained 7 people for 16 hours of one-on-one training, or more accurately, re-training. Local employers have been very interested, supportive, and tapping into this new educational technology opportunity. Over time, the goal is for graduating students to get hired at these same types of companies. But in either approach we are steadily making progress in integrating practical 3D printing applications into our region and our entire state. So that we will have a workforce well suited for implementing cutting edge manufacturing innovations, as well as creating an ideal economic investment opportunity for tier one companies. You can find a host of resources on the SCC web page here on the “Research and Grant Materials” folder (marked with the red arrow via the link/image above). Professor Wooldridge has a variety of terrific case studies, videos, materials testing projects and photos, as well as some program brochures. All of this is in a shared cloud storage drive.